Over the course of having some twenty-five plus books published, a good majority all have something in common. You won’t find one skyscraper! You’ll find a lot of gorgeous views, barns, weird animals, and people who don’t live close enough to their neighbors for them to be a problem. I spend a lot of time creating fictional worlds in wide open spaces because that is absolutely my dream property. Plenty of land, beautiful views, and not a whole lot of people. Some of this stems from a childhood of spending weeks at my grandparents’ house in rural Iowa, where we would spend temperate days sitting on the porch or hiking the woods or with the windows open and not one noisy neighbor or rumbling traffic to interrupt the conversation or the blessed silence. We also used to spend our evenings on the west-facing porch and watch the sunsets, or if it was winter, on the couch through a big window that overlooked the same view. So, my main priority for a dream property would be huge west-facing windows and a west-facing porch so I could enjoy any and all sunsets. I love the mountains, especially the Rockies, and I love the varied beauty of Montana where I set my Big Sky Cowboys and Navy SEAL Cowboys series, but I’m a Midwestern girl at heart. I wouldn’t say no to mountains, but I also wouldn’t say no to woodlands, corn fields, or just rolling hills stretching out before me. As long as the view is uninterrupted, and I can enjoy all four seasons (mostly fall and spring), I’m not too picky. I’d love at least some woodlands or mountains I could hike through, with maybe a creek or a lake along the way. A quiet place to write, a gorgeous view, and uninterrupted silence. What more could a girl dream? Alex Maguire never thought he'd go home again. 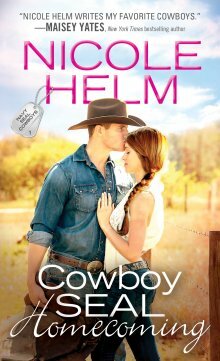 The perfect soldier, the perfect leader, he's spent his whole life running away from Blue Valley, Montana—but when a tragic accident bounces him and two of his men out of the SEALs, there's nowhere left to turn but the ranch he used to call his own...and the confusing, innocently beguiling woman who now lives there. I’m the bestselling author of more than twenty-five romance novels. I write down-to-earth contemporary romance and fast-paced romantic suspense. From farmers to cowboys, midwest to the west, I write stories about people finding themselves and finding love in the process. I live with my husband and two sons in Missouri enjoying Cardinals baseball and dreams about someday owning a barn.